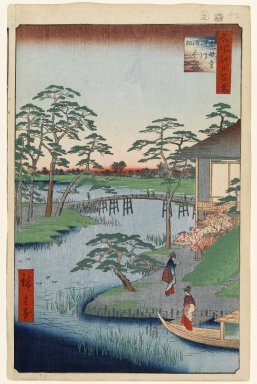 Two ladies are seen alighting from the boat in Uchigawa Inlet on their way to one of Edo's famous suburban restaurants, known as Uehan (named after the owner, Uekiya Han'emon) which specialized in taro and clams. The nearby Mokuboji Temple, not shown here, originated in the year 976 when a young boy (Umewaka) was kidnapped by a slave trader when he lost his way on the road near Kyoto and was brought here, where he finally died of sickness and exhaustion on the banks of the Sumida River. A wandering priest erected a mound in his memory, which grew into the shrine-temple complex of Mokuboji. The mound survives today and services in his memory are held each year on April 15. The area on the left by the pine trees was known as Gozensaihata, or "the honorable vegetable garden," which produced fresh vegetables for the shogun's table. This area was obliterated by bombing during World War II; both sides of the Sumida have been leveled and construction has begun to provide high-rise housing and emergency evacuation in case of flood or earthquake. Mokuboji was relocated to a site closer to the Sumida in the middle of what was once the mouth of the Uchigawa Inlet.